You're lost in the woods without food or water. Confronted by an armed assailant in the dead of night. Forced to outrun a deadly tornado. 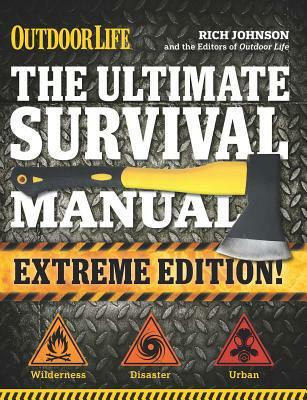 Don't worry - The Ultimate Survival Manual has you covered. Rich Johnson and the experts at Outdoor Life are the people that have been there and survived that; with the revised Ultimate Survival Manual they bring you all the information you need to do the same. Out in the Wild From navigating with a compass, to fending off a cougar, to prevailing over pirates, learn to survive in the forests, deserts, and oceans like an expert outdoorsman. During a Disaster Whether it's a towering tsunami or a blazing wildfire, bad things happen every day. Know what to do when the going gets tough. In an Urban Crisis Arm yourself with the latest self-defense moves, weapon tips, and home-protection tactics, plus crucial strategies for handling bad guys and bad situations at home and abroad. This revised and expanded edition ventures farther into deeper, scarier, and stranger places in search of the ultimate survival information. Packed with the hands (and feet, and teeth) -on tips, this go-to-survival guide will help you prevail over the worst that the world has to offer. With high-quality design, intricate detail, and a durable flexicover--this manual is the perfect gift. When it comes to survival, Rich Johnson's done a lot of it. He's worked as a demolition sergeant in the US Army Special Forces, a Coast Guard Auxiliary instructor, an EMT, a volunteer firefighter, and a policeman. In his off hours, he's excelled as an advanced SCUBA diver, paratrooper, sailor, and skier. He once spent a year living in a cave and eating bugs--for fun! He's written extensively for Outdoor Life and a number of other outdoor adventure and automotive magazines. For over 110 years, Outdoor Life has provided outdoor and urban survival expertise to millions of readers. Their authors have written on everything from disaster preparedness to subsistence hunting and fishing, to which guns to use against the undead (really!). Readers count on them for survival information from the everyday (how do I best bandage a bad cut) to the extreme (what if my town is devastated by a tornado? ).